Pretty please with spaghetti on top? Andy Buckland has always dreamed of being a chef. But after a live studio audience is stricken with food poisoning during her debut cooking show, she finds herself blacklisted in the culinary community. 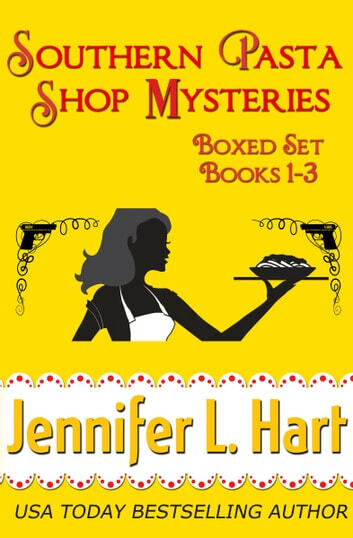 The only job open to her is working in her family's southern pasta shop, and, to make matters worse, her first assignment is serving baked ziti to her former lover and his spoiled bride-to-be at their engagement party! But a broken heart and a bruised ego are the least of Andy's troubles when she discovers a dead body at the party with the words "welcome home" written in flour next to it. Is it a warning? A threat? Or a frame-up job? Andy is determined to find out. With the help of her over-the-top Italian family, Andy will prove that she has what it takes to not only cook the best dish in town but also catch a killer, too! Andy Buckland isn't thrilled when sexpot celebrity chef Lacy L'Amour decides to open a competing ethnic restaurant in small-town Beaverton...right across the street from Andy's pasta shop, the Bowtie Angel. And matters heat up when L'Amour sets her sights on both Andy's customers and her man, Malcolm Jones, who has been acting strange lately. But all of that pales in comparison when Andy’s long lost daughter is suspected of arson. Suddenly the town’s outrage reaches a rapid boil, and the future of the Buckland-Rosetti clan is about to go up in flames. Can Andy beat the competition, keep her man, and catch an arsonist before her hard won reputation is reduced to cinders? Andy Buckland is no stranger to TV. The worst moment of her career happened when a live studio audience got food poisoning from one of her dishes. But when the pasta guru is given a slot in the televised cooking competition Diced Showdown, she sees her chance at redemption. In exchange for the shot at vindication Andy and her fiancé, Malcolm Jones, are tasked to find the identity of a mysterious blogger who has a nasty habit of revealing detrimental secrets of the show’s top celebrity chefs. A little undercover sleuthing is one thing, but when her hometown is taken over by the show’s production and one of the judges winds up dead, Andy’s afraid she’s bitten off more than she can chew, and she might just choke on a dish best served cold.